I've got to be a little suspicious of a plaything that never seemed to appear in any toy store in my neighborhood. Presto Magix kits showed up in card stores, hospital gift boutiques, and where I grew up; the butcher shop. Instead of theorizing about some cruel arts & crafts cartel, let's examine the friction based world of Presto Magix. If you're a model builder, or perhaps worked in the publishing world P.M. (pre-Macintosh), you probably remember dry transfer decals. These thin decals don't require water or solvents. You simply position the carrier sheet, rub down on the decal with a pencil which transfers the decal to your model or rock zine headline. Each Presto Magix kit includes a sheet of full color character decals, and a cardstock backdrop to use as a canvas to create your own fantasy scenes. Presto Magix licensed all manner of movie characters, cartoon personalities, sports teams, etc. so that you and your trusty pencil can create custom cartoon panoramas without really knowing how to draw. The best part is that once finished, there are usually plenty of transfers left over that you can use to populate your notebooks and folders. The decals are fragile, so even a tough-as-nails squad of Star Wars stormtroopers can be beheaded with one careless swipe of an eraser. Presto Magix are fun, but I hope that this isn't another plaything that barely passes as "creative". Granted you get to use some aesthetic sense when placing the little decal people, but all you're really doing is burnishing the little guys into place. We've written about a lot of DIY projects before here at Retro Thing, with varying degrees of creative value. Even with paint-by-numbers projects, you do perform the act of painting, and there are opportunities for individuality. Maybe I'm expecting a little too much from these little project kits. My fear is that as the label "educational" is applied to more and more inane things, fun and cheap Presto Magix kits could start putting on airs. I just like to think of them as probably the most fun thing that I ever found at a plumbing supply house. 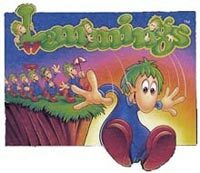 Pingus is a modern open source version of Lemmings, a brilliant graphic puzzle game first released for the Amiga in 1991. The goal is to save a gaggle of dimwitted little creatures that drop out of a trapdoor in the sky by guiding them to an exit. To complicate matters, the little critters have the awkward habit of cheerfully walking off cliffs whenever given a chance. The original game was ported to numerous platforms and sold millions of copies before disappearing into the mists of time [Update from fluffy in the comments: Lemmings was resurrected for the Sony PSP and is available as a PS3 download for $5.99]. 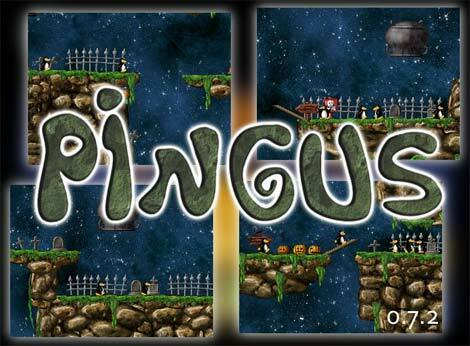 Project leader Ingo Ruhnke started developing Pingus in 1998, and the modern variant is strikingly similar to Lemmings, except that it stars a multi-talented cast of suicidal penguins. There are 22 tested levels on the first island of the Pingus' quest with more than 100 others available. The game runs in over a dozen languages and even comes with a full level editor, allowing you to create your own custom version. Pingus is currently available free for Windows, Mac OS X and Linux. The Tortuga 5 is a stunning limited edition pinhole camera, handmade in Luxembourg. Its polygonal case incorporates five pinholes that can capture five overlapping images simultaneously (with 242 degree coverage) or in sequence. The camera accepts standard 120 format film which can be loaded without requiring a darkroom or changing bag, and includes a standard tripod mount which enables you to position and level it to capture the best images. As with all pinhole cameras, you'll need long exposures to capture good images (2 seconds with 400 ASA film in sunlight, significantly longer indoors under subdued light). Oh, and don't expect to snap too many photos with this device - each roll of 120 film holds only two panoramic exposures. In keeping with it's old European charm, the Tortuga 5 is crafted from solid European plumwood with brass fittings and has been manufactured in a limited production run of only 30 units. The price -- including worldwide shipping -- is €1,230 ($1,925), putting it beyond reach of all but the most dedicated pinhole fanatic. That said, one has to admire the craftsmanship which has been poured into this beautiful device - from the brass exposure calculator built into the case to the clever cable release mechanism and the hand finished woodwork. This was once the way all cameras were made, after all. 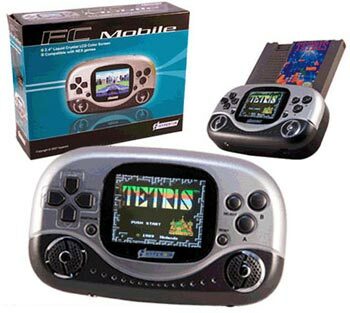 The FC Mobile is a handheld clone of the Nintendo Entertainment System, brought to you by the same gang who created the FC Twin Console (extensively reviewed by Bohus early last year). 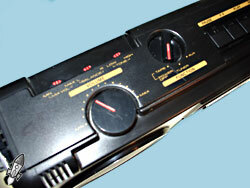 The FC Mobile runs on three AA batteries and features a 2.4-inch color LCD. It includes AV cables to plug into your TV, although that kinda does away with the main benefit of owning a portable NES. I suspect (but haven't confirmed) that it use a similar chip to its predecessors, which should offer reasonable but not identical game play. Bohus reported that FC Twin colors were slightly different than the originals and that the sound wasn't 100% perfect, although the game play seemed bang-on in the titles he tried. Technabob reports that these have been popping up on eBay for around $40 or $50, and they definitely look awesomely old school with the massive NES cart sticking out of the back. I wish the styling was a little more angular (and the controller layout a bit more faithful to the original), but this still looks fun. However, the main problem is that most people don't have a stack of NES titles lying around, but garage sale season is just around the corner and NES games can often be found at thrift stores for a mere buck or two. I'd pick one up for myself, but the shipping costs to Canada are extortionate. 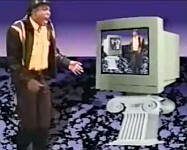 Hysterical Rap Video Warns Viewers "Don't Copy That Floppy"
Why is it that educational videos aimed at "the youth" are always so earnest and wrongheaded? It's not just cheesy 16mm classroom movies from 50 years ago, it seems like darned near any cautionary multimedia tale aimed at kids is destined to be cloying and ineffectual. The above video "Don't Copy That Floppy" is only from 1992, but judging by its cluelessness it may as well be a scratchy black and white film about how to behave at a weenie roast. This video is simultaneously fascinating and interminable. We start off with a loooong rap explaining how software piracy is shattering the computer industry. The video slows down with interviews from industry experts mewling about the harm done by casual copying. We bookend with even more rap that I don't remember anyone asking for, end credits roll. It's now ten minutes later, and you're so mad you're looking for your classroom's copy of Oregon Trail so that the piracy can really begin. Of course software piracy is illegal, and it does have real ramifications on the whole computer industry. Pirating your favorite game can make a publisher decide the title isn't profitable and stop development on future sequels. That's all true, but I really doubt that this propaganda film got that message out there. The tone of this video is so whiny and hopeless, it's as if the software industry is holding a gun to their own heads begging kids not to force them to pull the trigger. Remind you of any other desperate monopolistic industries you could name? If it makes you feel any better, I'm pretty sure that I can get all the guys in the filesharing torrent chat rooms to promise never to copy any floppies again - especially if we make them watch this video. Ebay has been alienating a lot of people lately. Sellers are unhappy about recent fee increases and changes in the feedback system. Buyers, especially video game buyers, haven't benefited from Ebay's simplified categories. Where auctions used to be sorted by classic systems, today everything is lumped under a generic "vintage games" banner. 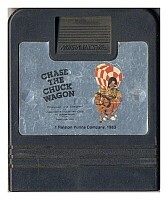 Chase The Chuck Wagon is a new auction site dedicated to video gaming, especially retro games. Their site is built on sellers fees that are "laughably less" than Ebay, the site owners are video game fanatics, and there are lots of tidy categories so you can easily find what you're looking for. There's even a weekly podcast that promotes rare and big-ticket items. It seems like a good idea to me. Ebay has become so huge that it's hard to get attention for your auctions, let alone get help from Ebay's tech support when you need it. 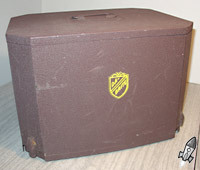 Paging through this new site I found lots of interesting auctions finishing at prices I wouldn't mind paying. There were also plenty of rarities to keep even a serious collector bidding too. The funny thing was that I couldn't find a copy of the infamous and rare "Chase the Chuckwagon" Atari game that the site is named after. It's a really lousy game, so no harm done. 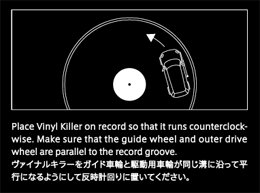 The original Razyworks Vinyl Killer was a VW bus that played your favorite LP record by driving around in ever-decreasing circles. 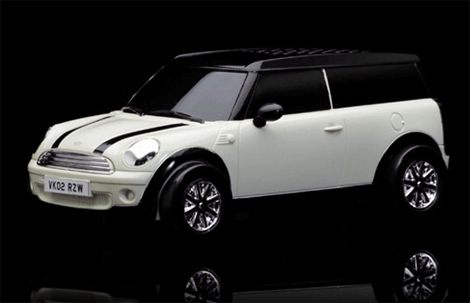 The wonders of modern miniaturization have brought us a smaller and sleeker version in the form of a tiny Mini Clubman. It still only plays 33 RPM disks (unless you enjoy 12" singles at 2/3 the normal speed). It costs 11,300 Yen ($110) with worldwide shipping -- enough to buy a real turntable that doesn't drive donuts all over your virgin vinyl. "It's not the record that spins. The world's smallest self running record player doesn't need turntables but churns out music by driving round the record with a needle that is underneath the car. If you have this, you can enjoy music whenever and wherever you are. 33RPM Only. 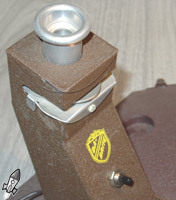 Built in motor, amplifier and speaker. Requires 9V alkali [sic] battery." 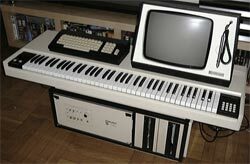 Pioneer made a name for themselves long ago as a maker of somewhat higher end audio and video gear. I'm sure that there's a lot of room to dispute just how great or near great they were, but personally I never associated them with a youth-oriented product like a boom box. 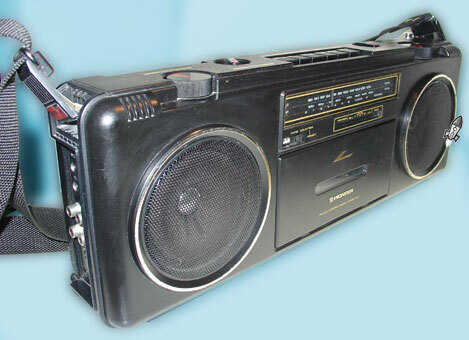 Most important is that the boom box sounds really good - better than many other slim-sized units from the time. It gets much louder than its size would make you think. Another stylistic touch is removing the usual rigid handle, instead offering up lugs for attaching the "Pioneer" branded nylon web strap. All in all, a very classy radio - the kind that your girlfriend might even let you buy. 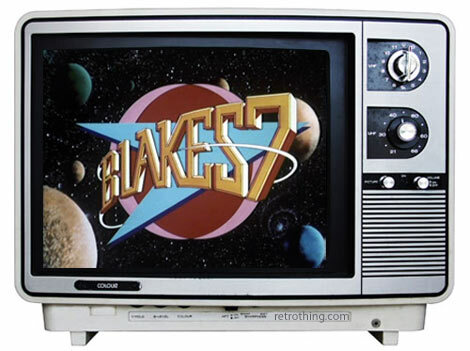 Sky One is planning a remake of British cult Sci-Fi classic Blake's 7. The original BBC show -- which ran for four seasons between 1978 and 1981 -- was heralded as one of the best science fiction series ever, despite its limited budget and pre-digital special effects. The Hollywood Reporter reports that Sky ordered two 60-minute scripts that retain the dark tone of the original. Let's hope the project lives up to its pedigree and gets the green light. "Blake and his gang of rebels cruised space in their hugely advanced space craft, the Liberator. They were fighting the evil federation, run by new romantic diva Servalan (Jacqueline Pearce). Blake's crew looked rather more like Abba, with their unflattering beige combinations of nylon and leather, and an endless supply of perming hairspray. Blake himself left after two years, leaving his rebels in the hands of Shakespearean schemer Avon (Paul Darrow). The show aimed to be a grittily realistic TV answer to Star Wars, only on Doctor Who's budget. The result is controversially stylised, with bold use of Colour Separation Overlay, bright lighting and big hair." Anyone who's edited a movie on film knows that it often feels like back-breaking work. 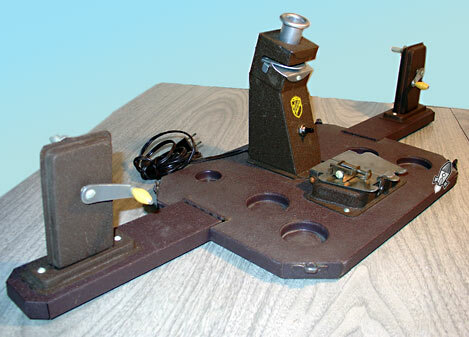 The torture chamber designers at Da-Brite introduced this home movie editor some time in the 30's. It's design is so awkward that you'll quickly limp away from your edit session for an early appointment with your chiropractor. As you can see, the Da-Brite is a very simple editor. It's not intended that you' watch your whole movie on this device to make edit decisions (though I know masochistic editors who have). After all, there's no screen or even a shutter inside the viewer. Without a shutter the film just whizzes by your eye without conveying the illusion of images in motion. So you have to make your edit choices elsewhere - probably using a projector. Then you're ready to make your cuts with the Da-Brite. The film travels through the eyepiece affair over a dim bulb (no jokes about your friendly film editor, please). 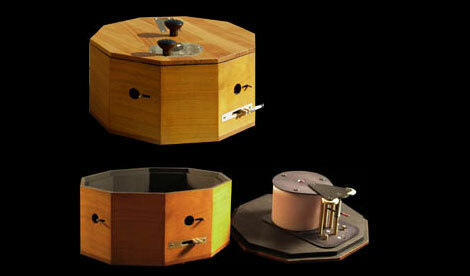 Then you use the built-in splicer to make your cuts. You can also see the cutouts in the base where you slot in bottles of film cement. Though the Da-Brite is a very simplified editor, you can cut at the exact frame you want, but there's still no good way to test how your resulting edits flow. You'll need to thread up your movie on a projector to really get an idea of how your edits are working. Perhaps it's the early availability of these microscope styled editing devices that put home movie enthusiasts off of editing their films. After trying to use this awkward device to execute just a few simple cuts, I can concur that editing movies on the Da-Brite is a genuine pain in the neck. 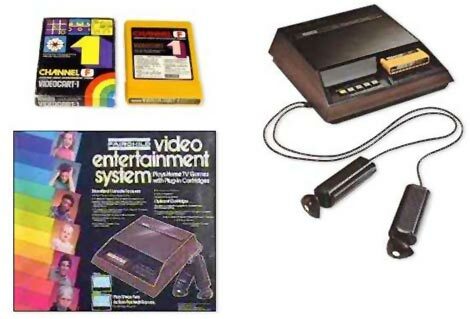 Check out this site, featuring seventy-one consoles ranging from the groundbreaking battery powered microprocessor-free Maganavox Odyssey to the virtually unknown XaviXPORT, which offered gesturally-controlled game play similar to the Nintendo Wii. 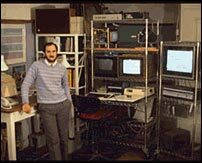 Fairlight founder Peter Vogel uploaded some classic videos to YouTube last weekend, including a peek inside the Fairlight factory in 1984 (above), Greg Sneddon demonstrating the Series III, the development of the CVI video processor, and a prehistoric 1980 TV appearance on ABC's "This Week," featuring a rather nervous young iteration of Peter (who bore a striking resemblance to Yanni in those early days). The first time I ever played Stratego was only a few months ago. As a kid I was way more caught up in the monetary machinations of Monopoly. Back then I thought that Stratego was a simplified form of Chess, a game I already knew. Turns out that there's much more to the game than that. Stratego is a battle fought on a 10 x 10 square grid. Each player deploys their troops to protect his flag, but the ranks and abilities are secret from their opponent. 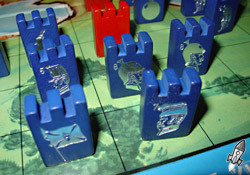 As players move around the board, they uncover their opponent's troops one by one. Not only is memorization important, but you can also plant misinformation by how you move your pieces - make your opponent think there is a bomb where there isn't one, lure him to a piece that might be your flag when in fact it's a heavily fortified garrison There's more to this game than meets the eye. 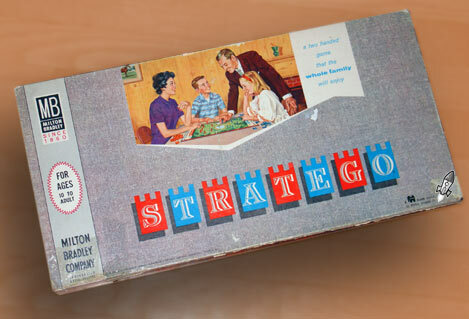 The Milton Bradley version stormed these shores in 1961, though similar games date back to about 1910. The board pictured here is an early set with wooden pieces which were quickly changed for plastic. The change wasn't just an economic one - the plastic pieces have a more stable base and are not as prone to tipping over. In recent years Stratego has seen many branded versions for Star Wars, Lord of the Rings, electronic and video game flavors... though the latest issue of the original board game has blank pieces with stickers that you have to put on yourself. That's a far cry from the classy metallic printing of every version that came before. Many of my friends are into elaborate wargaming, I can't wrap my head around all the gaming-related paperwork. When I asked them where their interests began, many cited Stratego and Risk. They also said that even for seasoned gaming veterans, there was still plenty of interest in such "simplified" war games. Having said that, there are many groups who take Stratego very seriously, creating websites with strategies and organizing tournaments. So maybe it's time to lay down our video game controllers and our 20 sided dice, and duke it out in one-on-one battle. Casio is celebrating the 25th anniversary of their G-Shock line with a limited edition gray skeleton watch. The G-Shock was designed in 1983 as the world's toughest watch, designed to withstand a drop from a three story building - hopefully not while attached to your flailing wrist. The limited edition 25th Anniversary G-Shock Skeleton retails for a stunning $130 (you can find a basic model in stores for under $50). It's water resistant to 200M -- a depth that would crush you in an instant, ensuring that you never put their claim to the test -- and includes a multi-function alarm, EL backlight, stopwatch and all the other things one has come to expect from a typical digital watch. 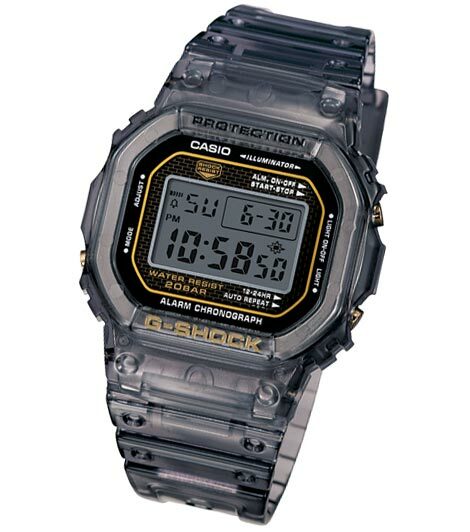 For true vintage digital timepiece fans, Casio also offers a Casual Classic line of watches hearkening back to the angular days of the early 1980s. Most are pretty basic -- simple retro silver or black, without fancy Sport doodads or complicated extras. You get the time, a calendar, maybe an alarm, and a little light for reading the display in dark caves or cupboards. Prices start at an almost silly $13.95. A friend and I presented a brief history of computer animation to a second year film class in the mid-1980s. 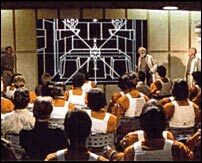 I vividly remember that one of the example sequences was the crude B&W wire frame death star briefing room sequence from Star Wars. The animation looks incredibly crude by today's standards, but it was brilliantly futuristic in 1977. Cuba used the computer-generated film Arabesque - which he programmed in collaboration with John Whitney - as a demo to prove his chops to George Lucas, and I'm sure he had no idea that his work was going to become part of one of the most popular science fiction films of all time. Cuba recently explained the origins of the vintage footage: "This 'making of' video was originally produced for my personal presentations as I was often asked to explain the process (back in the 70s and 80s when it was still obscure). Lucasfilm was vigilant in protecting its copyrighted material but OK’d this video at the time, since i had no intention of distributing it. (although copies apparently escaped) I wonder what they would say, now that the EVL in Chicago has resurrected it (after 30 years!) and posted it on YouTube.